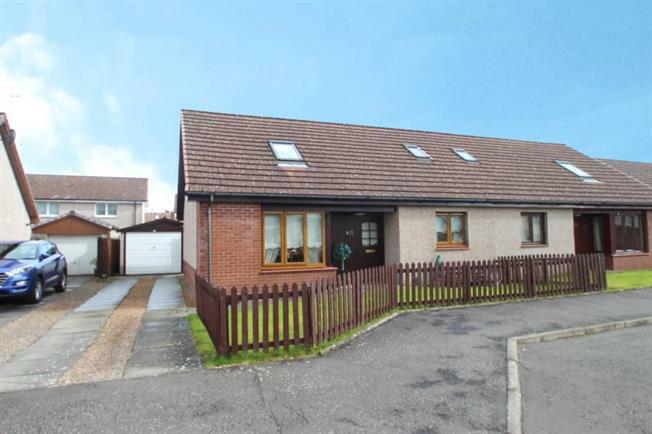 3 Bedroom Semi Detached For Sale in Denny for Offers Over £150,000. This is a great opportunity to purchase a stunning and well proportioned three bedroom semi detached villa which enjoys a highly sought residential pocket within Dunipace. Internally this beautifully appointed family home offers flexible accommodation comprising of welcoming reception hallway, bright front facing lounge, a lovely fitted dining kitchen complete with a range of base along with wall mounted units and complementary worktops. There is also two double sized bedrooms and luxury three piece family bathroom located on the ground floor. Take the single flight staircase to the upper accommodation consisting of a fabulous master bedroom with a large three piece shower room en-suite and a separate walk-in dressing room.. There is good storage throughout the layout of property which has been neutrally and tastefully decorated and further enhanced by gas central heating and double glazing. Externally, the property sits amongst low maintaince gardens, with driveway to the side providing off street parking and access to the detached garage, whereas the rear gardens are predominantly laid lawn, sun terrace offering a high degree of privacy. Dunipace offers a fine selection of amenities including shopping that caters for every day to day need, schooling at primary and secondary levels and excellent access to the M876 motorway which offers the commuter direct access across the central belt via bus and rail to Glasgow, Edinburgh and Stirling city centres.